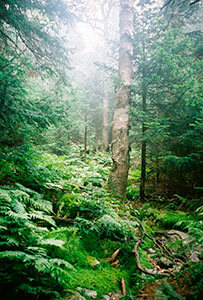 Each spring about 2000 people begin the walk north from Springer Mountain, Georgia, on a foot path called the Appalachian Trail. 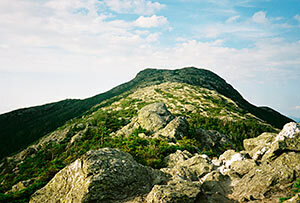 Their hope is to reach the State of Maine and summit Mount Katadin before winter. Many seek adventure, or a quest for personal transformation. Others challenge the trail as if it were solely an athletic event. About ten percent complete the 2175 miles to qualify as 'through hikers', but many more have the experience of a lifetime. The trail was established in 1926 to expose the natural beauty of the Appalachian Mountains to city dwellers living on the eastern seaboard. The original path was completed seven years later. Benton Mackaye, the trail's founder, never envisioned that anyone would want to hike the entire trail. However, in 1946, a World War Two veteran by the name of Earl Shaffer was the first to prove him wrong. The experience helped Shaffer transition from combat to civilian life. Trail officials were astonished by his story and were convinced of his journey only after a thorough debriefing. They doubted the cultural validity of hiking as a form of recreation for the common man. At that time the majority of Americans did physical labor for a living, and society looked upon walking as a form of work not leisure. This attitude has changed with the times. Now it is fashionable to pay to walk at a fitness club, but few can walk to work or take time to hike on trails that are free to the public. By 1960 many more had completed the trail and a good share of them were women. Dorothy Laker and Grandma Gatewood are the most famous, each having completed the trail three times before 1970. Gatewood was from the Appalachian foothills of Ohio and the mother of eleven children. She often joked that after having raised such a brood, hiking was a relief. Since then over 8000 people have completed the trail, with about twenty percent known as 'section hikers' for having completed it over a number of years. Countless others hike the same sections each year for days or weeks at a time. Many volunteers spend thousands of hours working on the trail as members of thirty trail maintenance clubs active throughout fourteen states along the trail. I first learn about the trail in the early sixties when reading a National Geographic article about a few adventurous through hikers. I can still remember the photo taken in Maine of a burly hiker fording the Kennebec with water up to his chest and back pack held over head. That was heady stuff for a teenager who loved the outdoors. I wanted to do that someday. Years later, after reading A Walk in the Woods, I started section hiking a week or two at a time. The next spring after Bryson's book popularized the trail, over 3000 started out from Georgia headed north, but their numbers would quickly dwindle. Some did not complete the eight mile approach to the official trail head. So inexperienced and overburdened by pack weight, many discarded their gear in order to walk to the nearest road. Later that spring in Damascus, Virginia, seasoned hikers joked that the abandoned gear was so plentiful they could have saved the cost of outfitting. However, this surge in interest was temporary and by 2001 the number of prospective hikers had decreased to historic averages. In order to permanently provide a natural corridor, the trail has gradually been relocated out of the valleys and up onto the mountain ridges. However, the trail still goes through a few historic towns. The town of Damascus, Virginia is one of the friendliest to hikers. Damascus holds special meaning for hikers because it marks the point where north bounders have completed about 500 miles. As a result hikers have always stayed over in Damascus to celebrate. In 1988 the town joined with the hiking community to create an event called the Trail Days Festival. Since then, the festival has grown to four days of organized activities and has become a special place each year for the reunion of hikers. Generations of through hikers camp together with each year's crop of new hikers. Outfitters set up shop to repair or replace hiker gear, the Appalachian Trail Conservancy sponsors workshops and the town folk put on a festival with food and entertainment. I always enjoy the nightly bonfire back at camp, when everyone gathers around to the sound of the drums and the dancer's shadows are cast high upon the tree. On the last day the hikers join with the people of Damascus in a frolicking parade down Main Street. Since the trail has been moved up on the ridges, the scenic vistas are more numerous, but the hiking has become more difficult. Originally, the trail included several hundred miles of road walking; now there are only twenty miles. With more elevation changes, and less periods of flat land, an average hiker can burn four to five thousand calories a day. As a result pack weight for long distance hiking is of great importance. Many hikers like the new technology and design of internal frame packs. Internal packs weigh a few pounds less than external frame packs, but the sizes vary by the cubic inches of volume. Hikers have to be careful not to select a pack with greater volume than needed. A heavy pack results in more blisters, sore feet and can be tough on morale in the early days. 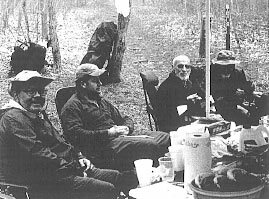 After the first three days, north bounders arrive at Neal's Gap where the outfitter can assist in reorganizing gear and cutting pack weight. A pack should weigh no more than one fourth of body weight, but I like my pack to be no more than thirty pounds when hiking the Appalachian Trail. While the trail has become more rugged with numerous relocations within the federally protected corridor, it has become less isolated from modern conviences as highways have been built closer to the corridor. In the past several decades many people have moved adjacent to the corridor due to their interest and desire to support the trail and celebrate the annual hiker migration north. Year after year as more lasting relationships develop between people along the trail and on the trail a special culture has developed. Every spring this unique culture swells like the bud of a rhododendron and flowers in many individual gestures of good will. Most notable is the ritual carried out by hiker friends called 'trail angels' that provide 'trail magic' often in the form of food, drinks, and shuttles to and from the trail. In turn, hikers recount stories of the trail and the angels pass on rumors of what may be ahead. I will never forget the magic I received Easter morning '04. As I came down a mountain in North Carolina I recognized hikers seated in chairs eating from large plates of food. I was handed a menu by a man who introduced himself as Tar Heel. He and his family were cooking breakfast for hikers and providing each with a sack lunch to go. I carried his menu for 1000 miles and still have it today. One definition of magic is the art of changing consciousness at will. Tar Heel and his family have changed the consciousness of hikers every Easter since he completed his through hike in 91'. Through the months ahead I would experience similar gestures, but every hiker will recall that Easter morning at Deep Gap. Tar Heel is a trail name. Few hikers can resist the tradition of being given a trail name by fellow hikers. A trail good name arises from the perception others have of you after enough time has past coexisting in the woods. The process of giving and receiving trail names is a ritual, and portends human transformation. It signifies that hiking the trail can be a life changing experience, where what you will become is more important than whom you might have been. America is about transformation, exemplified by the nineteenth century migration from the settled East, to the open unclaimed frontier of the West. Like the frontier, trail life is simple, open, and democratic in the practice of common sense for the common good. Connected with Nature in a rhythm of simple living, the mind can emerge from the smog of digital images, to a refreshing sense of natural time and space. After several weeks in the out of doors, away from artificial light and virtual communications it is possible to begin the transition from clock time to natural time. The change begins with attention to the movement of the sun, the phases of the moon and the shift of shadow and light on the forest floor as its canopy responds to the seasons. The night is black and each star is brilliant from the mountain top and lake shore. Up and down the trail in Maine the constellations that symbolize the animals appear above the mountains to dance upon the lakes and the calls of nocturnal wildlife can be heard echoing from across the waters. The trail provides a place to bolster one's self identity or shed it for a new one. This nightly cycle eventually will enter the sleeping mind with new dreams that can fill one with a renewed sense of confidence, self reliance and independence. 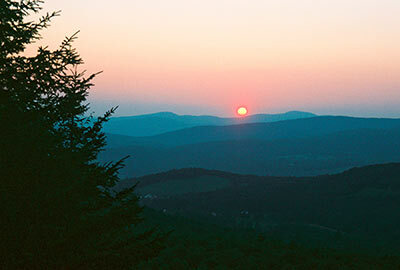 The Appalachian Mountains are a treasure chest for those interested in the natural sciences. The mountain range is the oldest in the world and has the greatest diversity of life in North America. I have a special interest in forestry and enjoy experiencing how the mix of tree species changed in relationship to local conditions of elevation and slope, and how the plant ecology changes with latitude. I am always surprised when I come upon local conditions that provide a niche environment for species to thrive hundreds of miles from their normal range. Not everyone observes in any detail the surroundings they are hiking through. Often it can become a blur. Photos help document the landscape features and the people, but lose their value over a long hike unless referenced on a topographic map. Those most physically prepared have energy to observe the natural world more closely, but often are not interested; while those less physically capable have a desire to focus on the beauty of nature, but often lack the time or energy. Most will agree that much of the trail is so rough, that to sight see while hiking will only lead to injury. One solution is to stop more often to look and listen. Often those that are physically prepared approach the hiking experience as a continuous field exercise. The trail registers are filled with their entries of bravado and daring. Some appear to be competing in an athletic event, using the trail as a track. This attitude is supported by official recordkeeping. For example, the record for completing the trail was set by two men who finished in 56 days within hours of each other; one walked while the other ran the trail. Neither of them carried a pack and both had a support team. Every year a substantial number back pack the trail in one hundred days with no special help. It is a mental challenge to put the competitive world behind. Each night, the conversation in camp turns to talk of the next day's destination; with expectations often voiced about reaching a town or hostel. Those anxious about not being left behind, nod in agreement while feeling the destination is probably too far. Others pipe up with assurances that the trail looks easy on the map with minor elevation change. Months later, few remain as naive as to assume that the trail is ever easy. But it is hard to resist the herd mentality, though it can ruin the potential for a wonderful experience. The experts will tell you that hikers over fifty need to take a 'zero day' each week in order to sustain themselves for five months or more of hiking. A zero day is defined as a day of no hiking. Some hikers may take fewer zero days, but spend less time hiking each day. During the first three weeks hikers should hike for fewer hours and take more zero days. Older hikers may want to continue this schedule indefinitely. For example, at the age of 82, Easy Going (trail name) was recorded by the ATC as the oldest through hiker. He completed the trail in eleven months last year. For those in desire of a life changing journey, hiking the trail is more about each days experience and less about miles hiked, more about being in the moment and less about scheduling the future. One trail maxim is 'if you're not having any fun, its time to quit', but there is another one that says, 'if you feel like quitting, wait a couple of days before you decide'. Woven in between these bits of wisdom is the practical advice, 'Hike your own Hike'. Hikers that make it through the first month without injury, are in shape to do 'the big miles' each day but often settle into a rhythm that includes; taking in all the great vistas, writing in their personal journals and reading what those ahead have written in the trail registries. The power of Nature will humble the most prepared long distance hiker. There is nothing like a spring snow storm in the Great Smokies or a blizzard in the White Mountains to reveal the care hikers have for each other. I will never forget the 26 days it rained in May, 2003 from the Smokies through the Shenandoah Mountains. One day in North Carolina, after hiking all day in the rain, I reached a shelter in the dark. The shelter's small opening was jammed with wet packs. Inside there were two low platforms separated by a narrow strip of dirt floor. I peered in through dim light, hoping to find a place among the two rows of hikers already bedded down. Each row had eight hikers squeezed into space designed for six. Without a tent, I suddenly felt out of luck. But, they gave me a cheery welcome and reached down to move their wet gear so I could find a place on the ground. The next morning we hiked to Hot Springs in the rain to learn that the town's power was out. Americans in general like to know that large expanses of wilderness still exist, but for the most part we prefer to remain in urban areas. We like to visit wilderness areas to be close to nature, but are not sure about being in Nature for extended periods of time. To a great extent we have become estranged from the wild. Some ecologists believe this estrangement has resulted from no longer being within Nature's food chain; no longer hunting to survive, or surviving to be hunted. This visceral dance with the 'Others' is distant in our minds eye, but can be witnessed for a moment with the encounter of a black bear or eastern diamond back rattler on the trail, or the glimpse of a bobcat on a ridge up above. The possibility of these encounters on the trail, make it a special place for those that enjoy people but have become at home in the back country. Successful hikers seem to strike a balance between human interaction, independence and comfort with Mother Nature. From the perspective of a south bounder the experience of nature and people can be different than that of a north bounder. 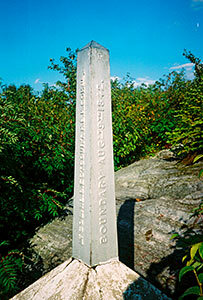 Spring comes later in Maine so most south bounders do not summit Katadin until late May or early June. The 400 or so south bounders have to be hardy because they immediately enter the hundred mile wilderness, the peak of black fly season and the need to carry eight days or more of food. After the mountains of Maine they face the rugged and steep White Mountain in New Hampshire and their number drop significantly. In Pennsylvania they pass hundreds of north bounders, who are feeling cocky and are delighted to meet others they can brag to. As a result, the South bounders complain about being repeatedly bored by the same tales of what is ahead for them. On the other hand, north bounders are often surprised by the difficulties that they encounter ahead, but can take comfort from being with more comrades. Tocqueville, the French author, wrote in the 1830's that Americans went outside to be alone and came home to be with others. When asked why I go on the trail by myself, I always say it is because I want to meet people of the same mind. I also go alone to be removed from the noise of society, to clear my head, and observe the life found in Nature. 'While backpacking in southern Virginia I came upon an old wooden building that had been a church. Its clapboard siding was weathered gray and its steeple had long since been removed and replaced with a platform for viewing the valley below. As I approached, I realized that the building was inhabited by large carpenter ants. They were moving in long columns up and down the walls onto the roof and platform. There are many books available to serve as good sources of information and advice on becoming a through hiker. However, personal experience is still the best teacher. The advice of others is like footwear, it has to be worn for awhile before you know it fits. But I cannot pass up an opportunity to offer a little philosophy. The first priority for a successful journey is to become mentally prepared. All else will follow. Start by expanding your knowledge of the trails natural history. Then think about how nature is different from the environment you live in and how your approach to daily decision making will change when living simply, out of doors. If you have camping experience, try to visualize how back packing ten to twenty miles every day will be different from camping. Think about what you want to have with you on the trail, and then think about what you will really need, than mentally prepare to do with less. This may appear counter intuitive, but remember you will be leaving an artificial world where the prevailing assumption is that more is better, and entering a natural environment where that is not the case. Uncertainty requires openness to change and flexibility in thinking. When living as a nomad, your ability to tap into creative instincts can be more powerful than the strict application of logic. Creativity provides the magic to do more with less. Once you are mentally prepared, chances are, all else will fall in place for a successful experience. Who knows, it may be a life changing experience based on the philosophy that the less one carries in life the more one can embrace the sustainable ways of Nature.